Hey there! I have a great lunch recipe today, one I used to love as a kid. My dad is what I call a weekend gourmet. Even though he works most Saturday mornings, often the rest of the weekend is spent cooking. Growing up I knew if he stopped at the grocery store on the way home Saturday, good things would happen the rest of the day. This is one lunch-time treat we didn’t have very often, but I always relished. Beat the egg and milk together in a shallow bowl. Heat the tomato sauce and keep warm while you proceed with the next steps. Lay 2 slices of bread on a board and cover with an 1/8″ layer of the mozzarella, then the rest of the bread. Add some butter to a large skillet and let it warm. 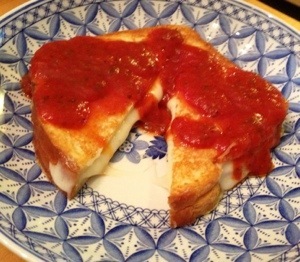 You’re ready to make a mozzarella grilled cheese, but before you do, dip the bread into the egg mixture, being careful to keep the sandwich intact while turning and coating the other side. Fry the sandwiches slowly so the cheese melts but the egg does not burn – about 3 minutes. Turn carefully and fry another 3 minutes or so. Serve topped with the tomato sauce and parmesan, if desired. You could also use olive oil with your favorite herbs and spices, or even a pesto, but I like it best with the tomato sauce. This entry was posted in Italian, Lunch, Sandwiches and tagged Carrozza, grilled cheese, italian, Mozzarella, sandwich, Tomato sauce. Bookmark the permalink. Hey Pete, what kind of mozzarella do you use for this recipe? Looks yummy! I actually used the block style because it has less water in it so the bread doesn’t get soggy. The fresh would be better, of course, but you’d either need to dry it a bit using a strainer or use some really stout bread that can stand up to the moisture. Glad you like it! Let me know if you try it!